Clothespins were created in order to peg clothes up on a line...but they have many other uses. We use them to keep food bags clothes (such as chips) by clipping the top of the bag closed. 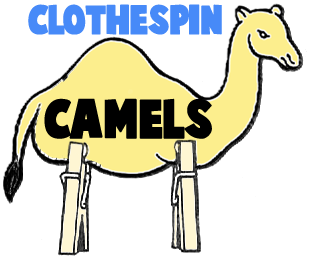 There are many different types of clothespins ...there is the old fashioned one-piece clothespins (which come in flattened one-piece and rounded one-piece) and the spring-type clip clothespins, which is the more modern version. 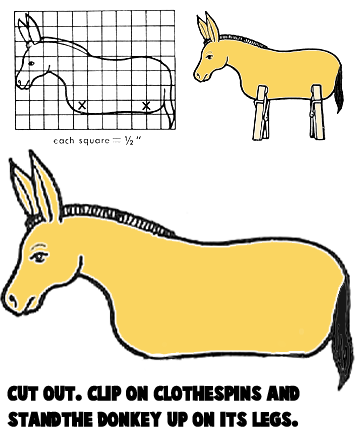 There are so many crafts to make out of clothespins and you should always keep some around to make crafts out of. Enjoy all the crafts we have collected for you. There are all sorts of ways to dress clothespins up to make wonderful dolls. 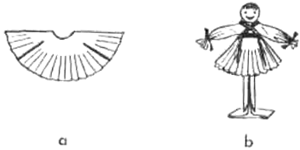 For the one shown in the above picture, use the clothespins with flat sides—they give more surface for the head and face. Mark in the face with ink or colored pencil. Glue some tiny bits of yarn on top for hair. For the doll's dress, fold a paper cupcake wrappers in 4. Cut a small hole at the center, just large enough to go over the head, and slash it, as shown in Figure a, for the sleeves and skirt. Use a piece of ribbon for a sash—to hold the dress in place—and tie a tiny piece at each wrist.The doll can be dressed in much the same way by using a circle of crepe paper instead of the paper cupcake wrappers. Fold and cut the crepe paper as directed above, and stretch the crepe paper around the bottom of the dress to make it ruffle and stand out. 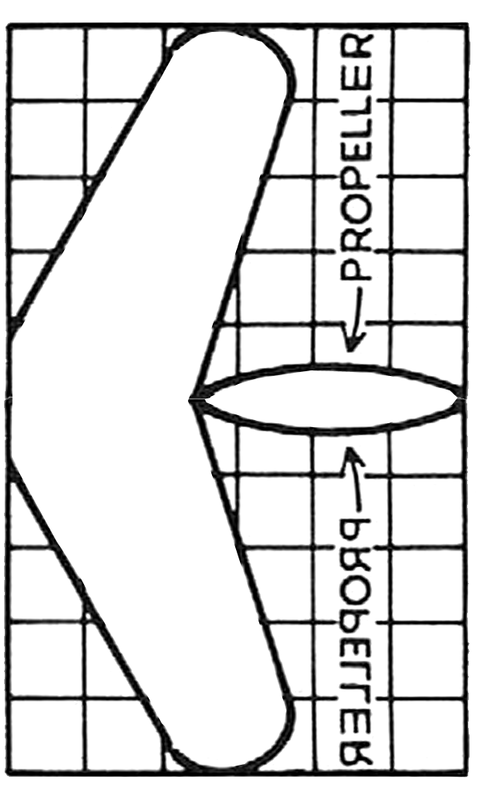 To make the dolls stand up, bend a narrow strip of cardboard, as shown in Figure b, to provide a sturdy base. You can use wooden clothespins or platic clothespins...however the wooden clothespins are the ones that make the barrel look real.To make this craft, find a nut-sized can and some clothespins. Firstly, remove the springs from the clothespins by holding it in your hands (image a) and just twist apart. 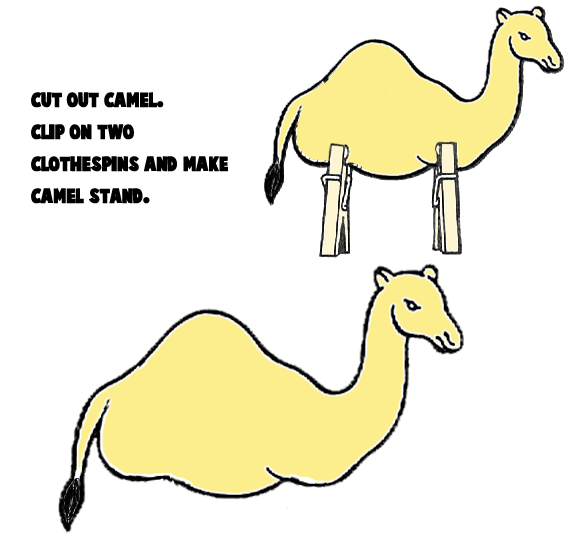 You will be using one half of a clothespin for each wooden stick you see around the can in the final picture above. Place all of the clothespins around the can (the outside of the clothespin is facing outwards) and hold it in place with 2 rubber bands...fitting one in each groove. Then when all the clothespins are covering the can, then wrap copper wire around the clothespins...again inside the grooves. Twist the wires together to hold them in place. You would use pliers to do this...you might need Mom or Dad to help you with this. This is a great craft for Preschoolers, Kindergarteners, and Children in the Earlier grades. 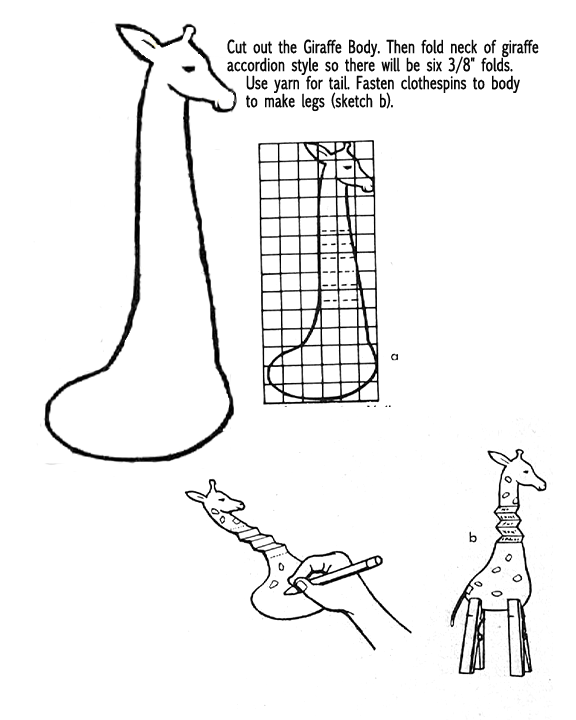 Firstly, print out either a color giraffe or black and white giraffe diagram. Then cut out the giraffe on the black outline (picture a). If you printed out a black and white pattern, then you might want to color it at this time. Then grab the giraffe's neck and lightly bend it forwards and backwards like you would a paper fan (it is called an accordion fold). 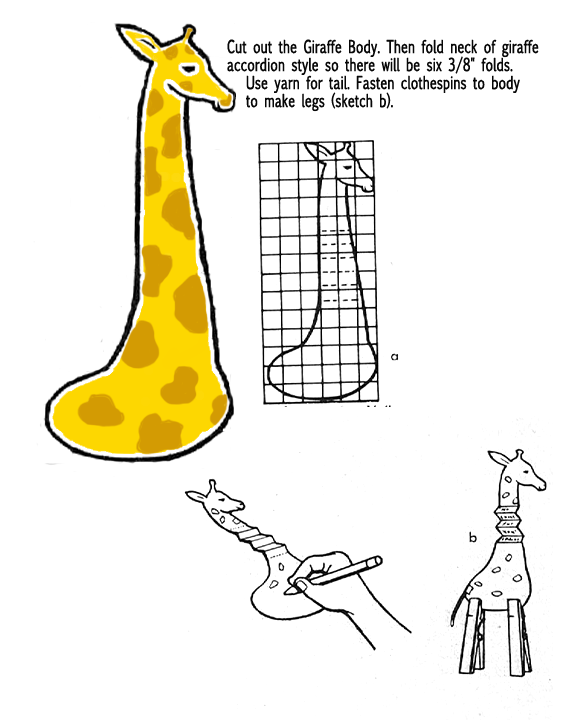 Cut a piece of yarn or string and glue or tape it to the back of the giraffe as a tail. 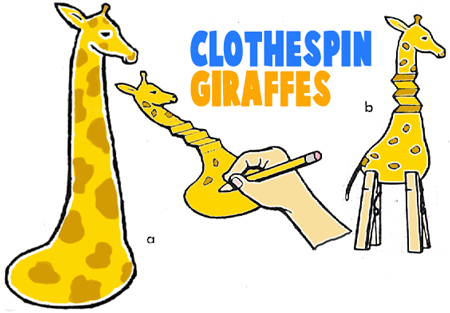 Then lastly, take 2 clothespins and attach them to the bottom of your giraffe. You now have a standing giraffe. A fun thing to do is to write a message on the folds of the neck...then when you pull the neck upwards, you can see the message. When you push the neck down, you no longer see the message any more. 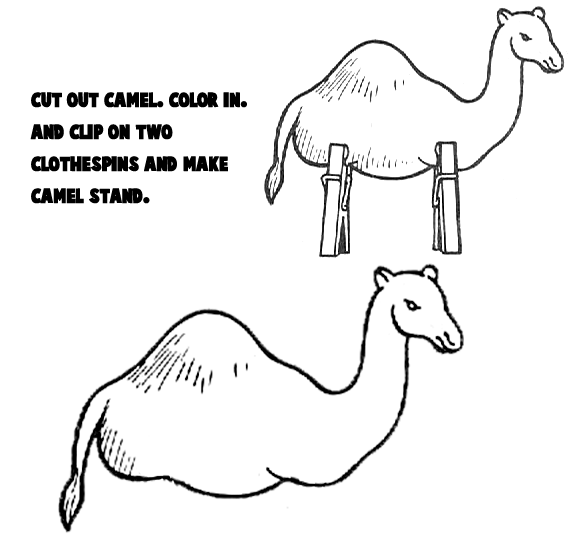 To make these clothespin camels, just print out either a black and white diagram or a color diagram and then cut it out and hook on 2 clothespins for legs. 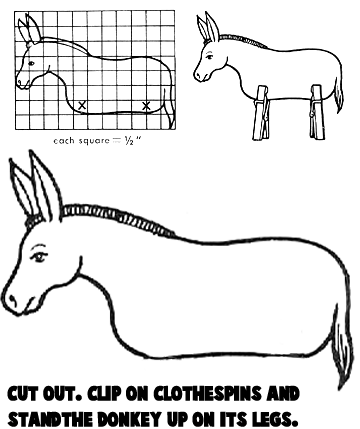 To make these donkeys just print out either a black and white or color pattern and then cut him out and hook on 2 clothespins for legs. To make this clothespin airplane glider, you will need to gather up the following materials - 1 non-spring type clothespin, Scotch tape, 1 thumbtack, colored construction paper 5"x3", 2 star stickers, and scissors. To make this, first, enlarge the pattern for wings and propeller of plane or print them out here and cut them out of construction paper. Tape wings to clothespin plane. Attach propeller with thumbtack. Sticker stars may be added to wings. How to Make a Ring Toss Throwing Game with a Box, Clothespins, and Rubber Jar Rings - Any handy boy or girl can make this game that can be played with one or more friends, either indoors or outside as well. All that you will need to make this game of skill is a few things from around the house. This is a great arts and crafts project for rainy days or for days that there doesn’t seem to be anything else to do. How to Make People Figurines with Clothespins - Learn how to use clothespins, yarn, and paint to make your own little people figurines. How to Make a Boy Scouts Memo Holder with a Clothespin - Today we will show you today how to make something simple and fun: a memo for Boy Scouts. Now the boys can have a special place where they can write important Scout related topics down . Make Standing Clothespin Ghosts for Halloween - This is an easy craft to make, and all you need are clothespins, tissues, markers, and a piece of cardboard. 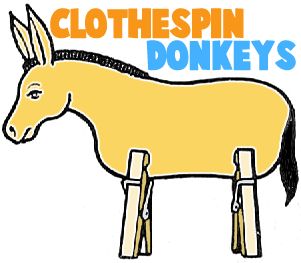 Clothespin Donkeys - Learn how to make these donkeys easily with some cardboard, yarn, and 3 clothespins. How to Make Clothespin Witches - This witch on a broomstich is made with a clothespin, some crafts foam or felt, paint, yarn, and a twig from outside. How to Make Clothespin Butterflies - Learn how to make these clothespin butterflies. Making Santa Clause Clothespin Ornaments - This tutorial shows you how to make a Santa Claus Clothespin Ornament. The craft makes a cute Santa Claus that is perfect to hang on your Christmas Tree. Clothespin Chameleons - Make these adorable Chameleons who can open and close their mouths with the following tutorial. Coffee Filter Butterflies - Find out how to make these adorable clothespin and coffee filter butterflies. Great for preschoolers and younger kids. Make a Grasshopper with Clothespins - Here is a cute idea to make a grasshopper with a wooden clothespin and some pipe cleaners. Clothespin Gumball Cars - Make a simple car out of clothespins, drinking straws, toothpicks, and gumballs. Napkin Clips Placeholders and Recipe Clips - Learn how to use a clothespin to make recipe clips and napkin holders / placecards. Clothespin Iguanas - Learn how to make these moving iguanas with a little help of a clothespin.